Dimensions 13.25 x 20.5 x 12 inches. 23 x 14.2 x 12 inches. 3 x 14 x 21 inches. 22.1 by 15.9 by 14.5 inches. 14 x 14 x 20 inches. 12 x 1.5 x 39 inches. 20.9 x 13.9 x 12.5 inches. 20 x 12 x 12 inches. 24 x 4.5 x 21.5 inches. 19.7 x 14.2 x 11.8 inches. Weight 9 pounds. 6.7 pounds. 4.4 pounds. 9 pounds. 6.5 pounds. 4.05 pounds. 16 pounds. 8.5 pounds. 10.2 pounds. 4.8 pounds. Warranty N/A. N/A. N/A. N/A. N/A. N/A. N/A. N/A. N/A. N/A. How to Select the Best Chainsaw Carrying Case? There’s no ‘one size fits all’ approach when it comes to purchasing a carry case for your chainsaw. Many factors must be considered before you jump right in and purchase one. Firstly, will the case fit the length of your bar? Will it carry your additional items? Will it be hardy enough to withstand a bit of knocking around? Is it the best deal? Have you shopped around enough both online and instore? There are plenty of options available to suit a wide variety of chainsaw users. Do your research and read the information in this buying guide to ensure you are fully informed before making a purchasing decision. Your chainsaw may be subject to some rough terrain, therefore it may need a protective case. Where you are and what tasks you are undertaking will determine the type of case you may require. For example, if you’re out in the rugged terrain of a forest, a hard case may be a more suitable option. If you’re just at home taking care of a few small trees, a soft carry case could be all you require. You may also need something with a bit more space for tools and products if you’re a professional carrying out work for a client in the field. Some cases come with space for not only your saw, but accessories as well. Do you need additional room for extra chains, oils or lubes? Do you need to carry around rags and spark plugs to complete servicing in the field? There are a range of options online and instore to suit your particular requirements. If your chainsaw is bound to be bounced around in the back of a truck bed, or it’s being transported from job to job, you may require a case which has a bit more durability. However, if it’s destined for a life in the garden shed, a soft case is more than sufficient. First identify the protection your chainsaw will need and this will help you make your decision. Often chainsaw carry cases come double walled. This will give an extra layer of protection for your saw. Others feature a type of ‘seat belt’ within the case to make sure your chainsaw is immobile for the length of its journey. The more durable the case, the safer your chainsaw will be. Many brands offer storage boxes or carry cases which perfectly fit their own branded products within, whilst others offer room purely for a saw and not much else. The best option is a carry case which offers space for accessories you may need to carry. Compartments that fit files, spark plugs, chains and oils will ensure all your tools of the trade remain together. Some carry cases also have harnesses within the case, as well as sturdy clip-locks that don’t accidentally bounce loose. 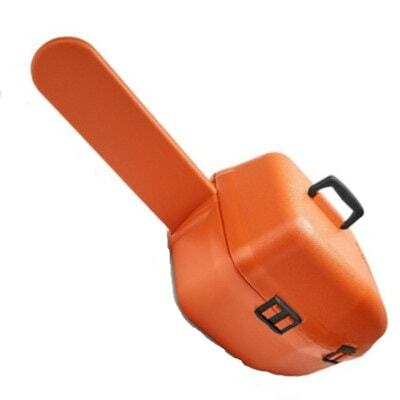 The best carry case is one which will hold your saw and accessories safely and securely. The carry case you purchase can often depend on your budget, but the key is to not skimp on quality. Within this buying guide we aim to show you the best chainsaw cases for the money, without purchasing a lesser-quality item. There are many different manufacturers and brands offering high quality storage box and carry case models – all for sale at varying prices. If your decision is price-driven, you can certainly get the best deal online on websites such as Amazon. More durable to withstand more pain. They don’t often come apart accidentally as easier as less durable models. They can often be heavier. They take up more room in tool sheds and vehicles. 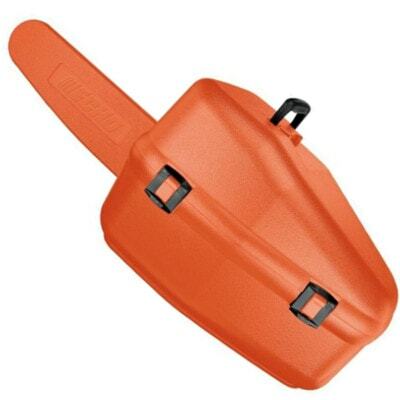 Double-walled carrying cases are perfect for those who require their chainsaw to travel with them. If your chainsaw is going to be bouncing around in a truck bed or the trunk of a car, a double-walled storage box or carry case is the best option. They are less necessary when the chainsaw will spend the majority of time at home. Double-walled carrying cases feature a second liner within the shell of the box. It enables the outer layer to take the majority of impact without affecting the inner layer. This provides double the protection for your chainsaw and its accessories. Double-walled carrying cases and storage boxes often come with many more compartments than a standard carrying case does. They are often larger than a standard case which means there’s more room for both a chainsaw and all servicing products such as chains, oils and lubes. They are easier to carry to job sites than just the saw by itself. They fit well into garages, tool sheds and vehicles. They generally have a convenient carry handle. Many offer additional compartments for tools. The plastic can crack if heavy items are packed on top of it and around it. Plastic chainsaw cases are suitable for both professionals and homeowners in need of quality storage for their chainsaw. They fit nicely into vehicles and take up minimal room in tool sheds as well. 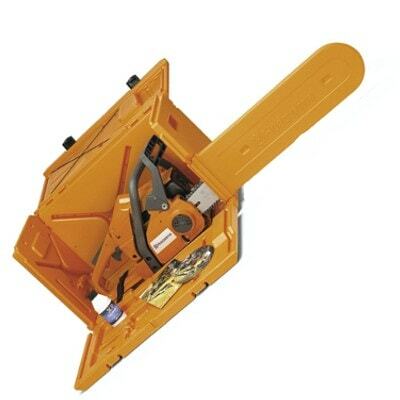 Depending on the manufacturer or the brand, many plastic chainsaw cases have ‘seat belts’ within the case to prevent the chainsaw from moving around. However, the attached scabbard takes care of this problem too by allowing the chain and bar to fit tightly in one spot. Some brands even offer a detachable scabbard which has additional space within it for tools. Many cases are even stackable. Plastic chainsaw cases are either made with just room for the chainsaw, or with compartments for accessories as well. The downside is that the compartments are open which mean when you open the container, parts may have moved in transit. It’s a great storage option for homeowners. It can easily be transported around the property by the carry handle or shoulder strap. You can’t place anything heavy on the bag or around it in case you damage the saw. It’s not as durable as a solid plastic case. It cannot be kept as clean as a plastic case. A soft chainsaw carrying bag is a good option for homeowners who wish to travel around their property without carrying the chainsaw itself. It’s a quick travel option and allows the chainsaw to travel with its accessories as well. It’s not as suitable for a professional, or large enough for a commercial grade saw. Soft carry bags don’t conform to a solid shape, therefore you can easily pack additional chains, lubes and oils in with the chainsaw. It has zip-up pockets as well which allow you to separate items from your chainsaw to find them easier. Although items can be zipped in different compartments, they aren’t as safe and secure as if they were in a plastic container. The soft material means items are at risk of being crushed in storage if not properly stowed away from other hard objects. It can hold the chainsaw and all its accessories and servicing essential products. It has a Husqvarna leash system to hold the chainsaw safely in place. The scabbard is suitable for bars and chains of between 18 and 20 inches. It’s visible in any outdoor environment due to its orange color. It’s heavy even without the chainsaw in it. 18 to 20 inch scabbard. Dimensions: 13.25 x 20.5 x 12 inches. QWhat chainsaws fit in this storage box? AAll Husqvarna chainsaws up to, and including, the 372XP and 575XP. QWhat size bar and chain will fit in this box? A18 to 20 inch bar and chain. AMost products needed for servicing including a quart of bar and chain oil, 2-cycle oil (6.4 oz), flat and round files with handles, a scrench, a spark plug, a file guide and vise and the manual. For a professional chainsaw user, this PowerBox from Husqvarna offers premium protection. It’s not only a great storage facility for a chainsaw, but it also offers protection for all vital service equipment for the chainsaw. 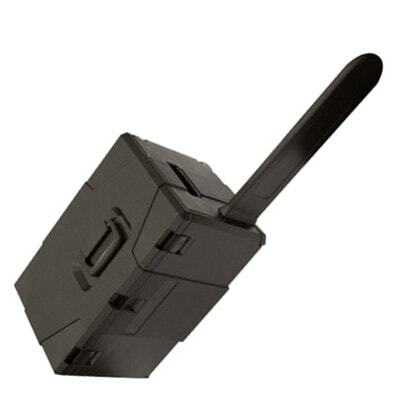 It can store it safely within the durable plastic case and you can then transport it to your next location with ease. It also offers a leash to keep the chainsaw safe, and is available online with a relatively inexpensive price tag. Check out what other people who purchased this product think about it. Read Husqvarna 100000107 chainsaw carrying case reviews. The scabbard protects users from getting cut on a sharp chain. It has double-wall construction for an extra layer of protection. It’s a vibrant orange color to be seen in difficult terrains or low visibility conditions. There’s not much room for additional accessories. It’s overpriced for what it is. Dimensions: 23 x 14.2 x 12 inches. QWhat chainsaw models fit in this storage box? A36, 41, 42, 45, 49, 55, 51, 242, 246, 254, 340, 345, 350, 351, 353, and 346XP. QWhat can fit in with the chainsaw? AA quart of bar and chain lube and up to 2 additional chains. For the homeowner in need of easy and comfortable chainsaw transport, this plastic carry case from Husqvarna will meet the mark. It’s not a top rated product, but it’s certainly a convenient one that enables your chainsaw, a quart of oil and an extra chain to get from A to B. It also fits a huge range of Husqvarna models which makes it one of the best chainsaw cases for the money. Check out what other people who purchased this product think about it. Read Husqvarna 100000101 chainsaw carrying case reviews. It’s made of heavy duty material which doesn’t rip or tear easily. It has a plastic bottom to make it easy to sit on the ground with more stability. The plastic tray within the bag catches any oil drips. The bag can tip over in transit which can allow oil collected in the drip tray to spill out. The sleeve needs a plastic coating otherwise the chain snags on the material. Dimensions: 3 x 14 x 21 inches. QWhat can fit in this bag? AThe chainsaw, scrench, files, a spark plug, ear protection, chain lube and an additional chain. QWhat bar size will fit in this bag? AA bar and chain of up to 20 inches. It’s hard to believe a bag would provide the same amount of convenience and support as a plastic carrying case. 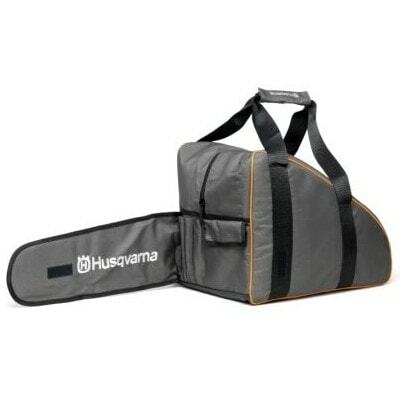 Husqvarna makes this bag really work! It’s fitted with a plastic tray in the bottom to catch oil drips and add support, and it has plenty of pockets for tools of the trade. It’s even relatively easy to clean. However, the sleeve for the bar needs plastic as the chain catches on the material. It also needs to be more stable in the bottom to stop it tipping over in transit. Overall though, for the cost of the bag, it’s one of the best chainsaw cases for the money. Check out what other people who purchased this product think about it. 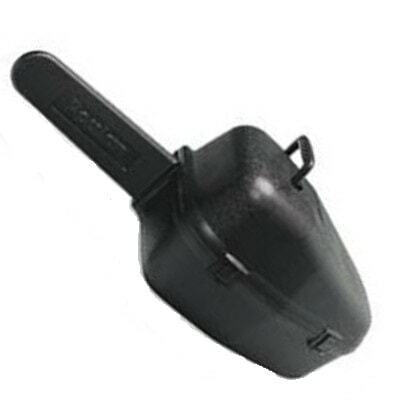 Read Husqvarna 5768591-01 chainsaw carrying case reviews. It can fit other brands of chainsaws, not just Poulan. The plastic is very strong. It’s quite heavy which can make it cumbersome to travel with. Dimensions: 22.1 by 15.9 by 14.5 inches. QWhat chainsaws fit in this carry case? AChainsaws with 18 to 20 inch bars and chains. QWhat kind of hinges does it have? Looks are very deceiving when it comes to this Poulan Pro carry case. Even though it appears cheap and not very durable, it actually is. The hinges are heavy duty for keeping the chainsaw enclosed and the plastic is thick and durable. It’s easy to travel with and can fit a few accessories in with the saw for added convenience. However, you take the good with the bad. For the cost of this case you would expect to be able to lock it, but that feature is not included. It’s also quite heavy and that’s before the saw is even fitted inside. Overall, it’s not a bad carry case for the money. Check out what other people who purchased this product think about it. Read Poulan Pro 952031152 chainsaw carrying case reviews. The scabbard is removable – this is a unique feature not often found on other brands. It has a durable latch. The scabbard has built-in tool holders. It’s lightweight in comparison to some other makes and models. It has a limited variety of models which it can carry. There’s huge price disparities between buying it online and in store. There’s not a lot of room around the saw for accessories. It doesn’t have space for a chain which is quite essential. Dimensions: 14 x 14 x 20 inches. QWhat chainsaws will this fit? AMS 170 through to MS 460, with a bar and chain up to 20 inches in length. QWhat STIHL saws don’t fit in this case? AMS 441 and wrap-around handle saws. Although STIHL is a good brand with plenty of quality products on offer, you would expect this chainsaw carry case to be a lot cheaper than it is. In comparison to others on the market, it’s quite expensive yet offers less features than many competing brands of storage box. It has minimal room for accessories, no room for a spare chain, and it only caters to a small range of STIHL saws. Overall, this isn’t one of the best chainsaw carry cases for the money. Check out what other people who purchased this product think about it. Read STIHL 0000 900 4008 chainsaw carrying case reviews. It is a very vibrant orange color to stand out in natural environments. It has ample space for a lot of accessories. You need to fit a scabbard onto the bar and chain within the bag to avoid damage in transit. The chain can get hooked on the material if not encased in a scabbard. The shoulder strap isn’t long enough. Dimensions: 12 x 1.5 x 39 inches. AA chainsaw and everything needed to service your saw out in the field, including additional chains. QWhat size bars will fit in the bag? QWhat chainsaws will fit in the bag? ACS-450, CS-271T, CS-341, CS-355T, CS-310, CS-352, CS-370, CS-400, CS-450P, CS-500P, CS-550P, CS-600P, CS-680, CS-590 Timber Wolf, CS-620P and CS-620PW. Considering it’s made of canvas material with little to no interior support, this bag can hold its own against outside elements. The chainsaw and accessories within are well protected and they are also easy to spot due to the vibrant coloring of the bag. To keep the saw from moving there is also a strap, as well as plenty of room for all items needed for servicing. The only true downside to this bag is the shoulder strap. It’s neither sturdy enough to handle the weight of the saw, or long enough to carry easily on your shoulder. However, it’s an extremely cost effective option in comparison to bags and carry cases produced by other manufacturers on the market. Check out what other people who purchased this product think about it. Read ECHO 103942147 chainsaw carrying case reviews. It’s suitable for both professionals and homeowners. The latches are very secure. It’s aimed at professionals but it doesn’t fit a commercial grade saw. Most carry cases suit chainsaws with 20 inch bars, this one suits only up to 18 inches. Dimensions: 20.9 x 13.9 x 12.5 inches. QWhat’s the case made of? QWhat chainsaws will fit inside? AMost small to medium saws and all ECHO branded saws up to CS-500 with an 18 inch bar and chain. AA chainsaw and most servicing equipment. This ECHO chainsaw case represents good value for money. Not only is it versatile in respect to the many models of chainsaws it will fit, but it also has plenty of space for chainsaw accessories as well. It’s cost effective in comparison to some other brands and models, and it’s also been top rated by many customers. Overall, this is one of the best chainsaw carry cases for the money. Check out what other people who purchased this product think about it. 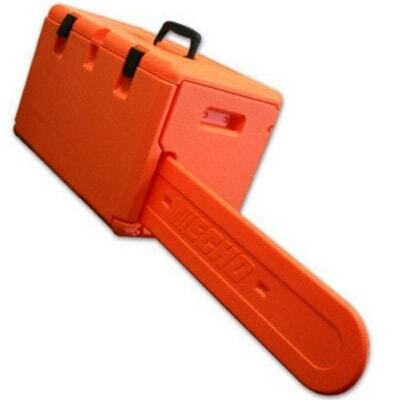 Read ECHO Small chainsaw carrying case reviews. It has a removable scabbard. It has a hole for a padlock. It has access through two doors. It’s not exclusive to any one brand of chainsaw. It’s very affordable – especially in comparison to some lesser quality storage boxes on the market. The directions to assemble it aren’t very clear. If it’s banged around, it can come apart. The pegs holding the assembly together are weak. Dimensions: 20 x 12 x 12 inches. QWhat bar length can it fit? AA chainsaw and all equipment needed to complete servicing. It even has space for eye and ear protection. This PowerKing plastic carry case is well-loved by many people who have purchased it. Not only is it affordable, but it also has a lot of room for accessories alongside the chainsaw. There’s no need to carry an extra bag full of servicing equipment – or even safety goggles. 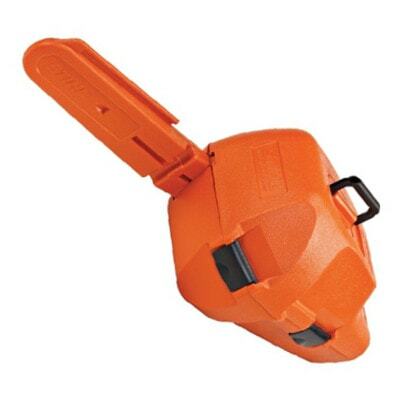 It can fit several models of chainsaw, as well as being made of durable plastic with an option to add a padlock. It also has two access points and is of a more sleek design than what several other brands are. Overall, it’s one of the best chainsaw cases for the money. Check out what other people who purchased this product think about it. Read PowerKing chainsaw carrying case reviews. It fits all ECHO chainsaws with bars and chains of up to 20 inches in size. It has plenty of room for servicing accessories. It’s easy to transport from job to job, making it perfect for homeowners or professionals. It can’t withstand too much pain without becoming unassembled. Dimensions: 24 x 4.5 x 21.5 inches. QWhat chainsaws fit in it? AAny ECHO chainsaw with a bar and chain of up to 20 inches in size. ANo, you have to assemble it yourself. QWhat are the inside dimensions? A11 x 18 x 10.5 inches. This ECHO carry case is one of the most cost effective chainsaw transport options on the market. In comparison to other makes and models it also offers a lot more bang for your buck. There’s plenty of room for additional accessories alongside the saw, and it can cater to all ECHO chainsaws with bars and chains up to 20 inches long. The plastic is durable, as are the clips, and it’s easy to assemble. However, it’s quite heavy in comparison to other brands and it can also come apart at the joins when knocked around in a vehicle. Check out what other people who purchased this product think about it. 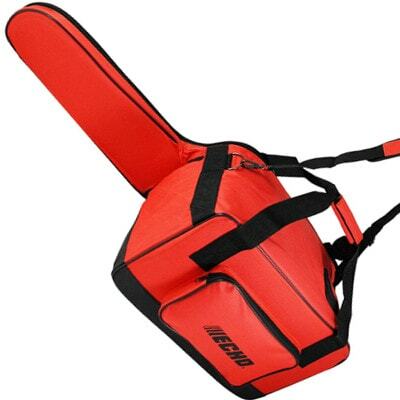 Read ECHO 99988801210 ToughChest chainsaw carrying case reviews. It has a nice color scheme. It’s constructed of durable plastic. It’s only designed for use with the GreenWorks 80V chainsaw. It’s not easy to spot in a natural environment due to the dark color. Dimensions: 19.7 x 14.2 x 11.8 inches. QWhat can fit in this case? AA GreenWorks 80V chainsaw, an extra bar and chain, and smaller items within the handle space of the storage box. QWhat chainsaw can fit in here? Even though this chainsaw carry case is affordable, it has a very small target market. If you don’t own a GreenWorks 80V chainsaw you are best to purchase a different brand of carry case. It’s definitely not the best deal on the market either as it can only fit the basics required for electric chainsaws such as an extra bar and chain. However, if you do happen to have a GreenWorks 80V chainsaw, you’ve hit the jackpot. This carry case is lightweight and very durable. Check out what other people who purchased this product think about it. 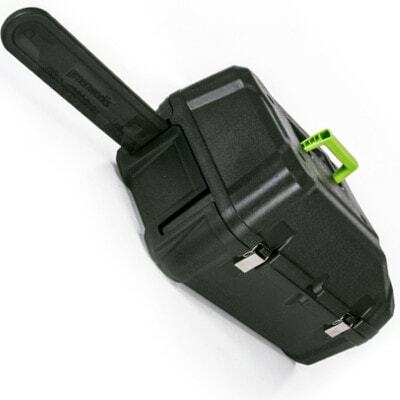 Read GreenWorks HC0A00 chainsaw carrying case reviews. Where to Buy Chainsaw Carrying Cases? Affordable and top rated chainsaw cases can be purchased both online and in any stores selling chainsaws. However, to get the best deal you should look at making your purchase on a website such as Amazon. Amazon also provides excellent reviews from other customers which makes it easier to know whether the chainsaw case you are looking at purchasing is the right fit for you.